Are you ready for a meaningful hobby that not only is a creative outlet but helps you find more joy in life? 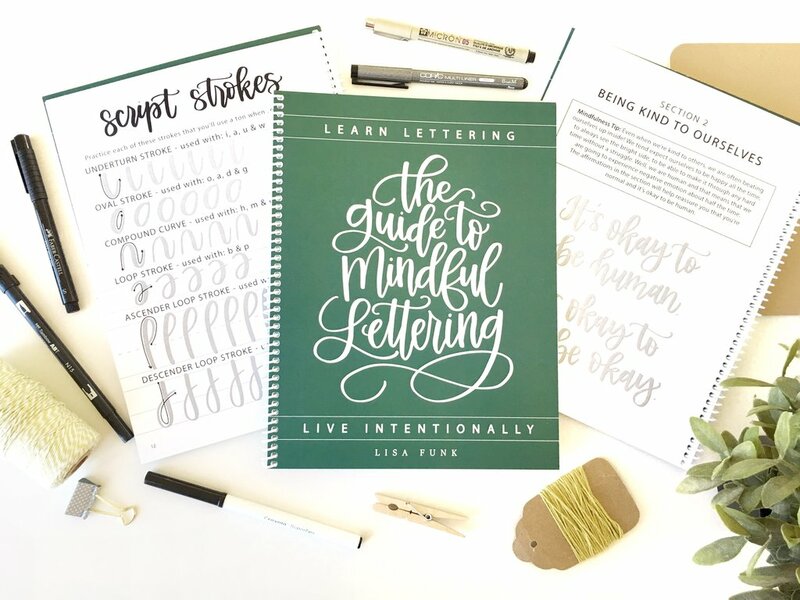 The Guide to Mindful Lettering is for you! It will teach you all the tips you need to learn brush lettering and also has 50 positive affirmations that you can trace and re-write as an inspiring mindfulness practice. This book teaches how to use Brush Pens to create Brush Calligraphy which is a different skill than Faux Calligraphy (which we teach in the Creative Lettering Journal). The book has a sturdy matte UV cover and nice, smooth, heavy pages that won't bleed (hooray!) and a spiral binding to lay flat. Please allow 2-3 business days to process your order before it ships. Thank you! During one of the most challenging times of my life, I found lettering and it saved me. It gave me an escape, a creative outlet and a reason to look for positivity. I clung to the inspiration that I would write and re-write as I practiced and it brought so much joy to my life! I started teaching in-person workshops to share my love of lettering. I've distilled that knowledge and experience down to the essentials here to help you get started with brush pens. 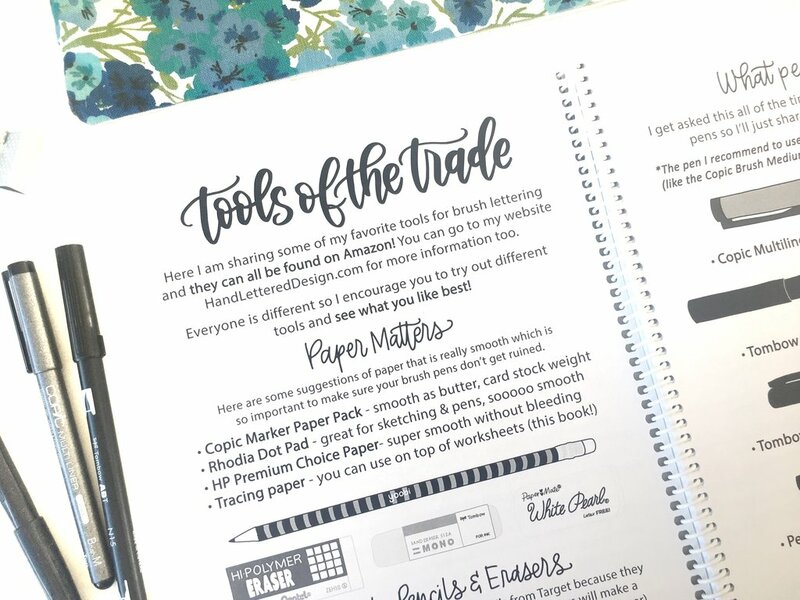 In this workbook, you will learn the basics of Brush Lettering. We'll start by covering the terminology and tools and then jump into exercises to improve your control of the brush pen with your up and down strokes. After practicing your strokes we will then cover how to create each letter! I recommend covering each page with tracing paper so you can repeat the practice activities again and again. The purpose of this workbook goes beyond just covering the basics. 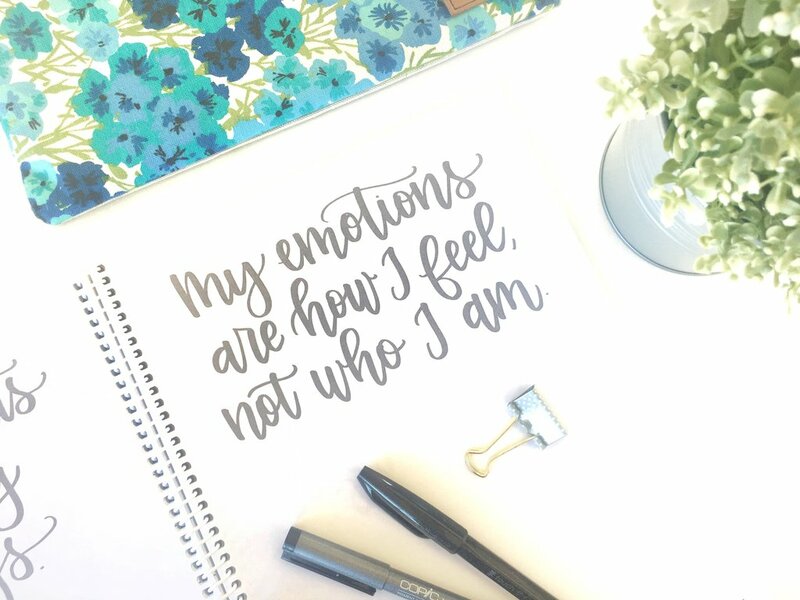 I want to show you how to use your lettering practice as a way to meditate and release stress from your life. We focus on internalizing positive affirmations that can heal your mind and create a purposeful life you love! This is the great reward that comes from lettering! So if you're ready to get started, click the Buy Now button below and I'll next show you some brush pens I recommend you buy with the book! And the book is available with a top binding to make life easier for lefties!